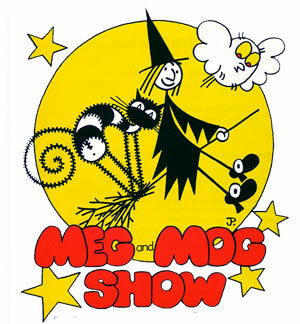 Meg is a loveable witch whose spells are always going wrong. after the OVERTURE, she introduces her cat, Mog and her Owl, Owl. (MEG, MOG, AND OWL). Meg tries to make breakfast by magic but the spell goes wrong and she makes a hungry Stegosaurus instead. He starts eating everything in sight in Meg's house and garden (STEGGY STEGOSAURUS). Meg, Mog and Owl are powerless to stop him without a "Getting-rid-of-Steggy" spell so they fly to the Witches' Spell Party to ask for one. (WHICH WITCH IS WHICH?). But they give Meg, Mog and Owl what they need (THE SPELL) and send them to a castle in search of the first ingredient, a red ostrich feather. This they are given by a grateful Sir George after they help him defeat the bullying Sir Francois. (TO THE ZOO). They discover the tiger has escaped, and the Zookeeper, whose spectacles have been broken by an elephant, is so shortsighted he mistakes Mog for the tiger and locks him in a cage. Meg tries a transposition spell to make the tiger change places with Mog, but it goes wrong and Owl finds himself locked up instead. 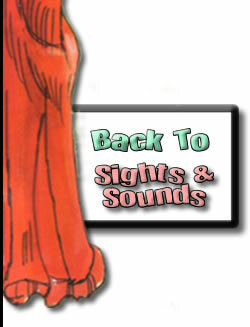 Unseen by Meg, Mog and Owl the tiger appears and stalks them (TIGER MUSIC). He chases them, but turns out to be friendly (LONG IN THE TOOTH). He gives them a tooth. After the ENTR'ACTE, Meg, Mog and Owl set off for the third ingredient - moondust (DAY TRIP TO THE MOON). They help a stranded astonaut, then fly home to their garden, which has been totally destroyed by the rampaging Stegosaurus, who has grown very fat and eaten so much he feels sleepy (STEGGY STEGOSAURUS REPRISE). Using the three ingredients Meg chants the "Getting-rid-of-Steggy" spell. (THE SPELL REPRISE) but the spell goes wrong and the Zookeeper appears. He has never seen a Stegosaurus before and offers to take him to the zoo. Meg is so grateful she offers to mend the Zookeeper's glasses. At last her magic works (I GOT A SPELL RIGHT). The other witches arrive and they all collaborate on a spell to make Meg's garden grow again (GROWING MUSIC). They celebrate before leaving Meg, Mog and Owl to rest after their exciting adventures (I GOT A SPELL RIGHT / FINALE).